Add more weapons and maps. Did the community want a WW2 game before BFV dropped? I don't remember. Not me I was bored of ww2 they should have put the poll directly into console Battlefield games to get a true representation of what players actually wanted and not simply the results from forum hipsters who just want the good old days back. I'm tired of the few people that use here reddit or any other outlet ruling the silent majority and getting on their high horse because a handful of people agree with them. Not aimed at you Hawxxeye just my general opinion on the state of things. In general the feedback from the complete community would be very different from the community here. Keep in mind that this is a statement from EA towards it's investors and shareholders. They are trying to sell their company, so there is no rhetoric difference between them talking to investors or talking to us, as customer. It is just a different form of marketing speak and has no claim to being fully honest, precise or correct. Delaying the game, Firestorm and a couple of other core features was not great for business, there is no doubt about it. They make it sound as if this was all done in good faith and for all the right reasons, which is naturally debatable, when you look at the release game. 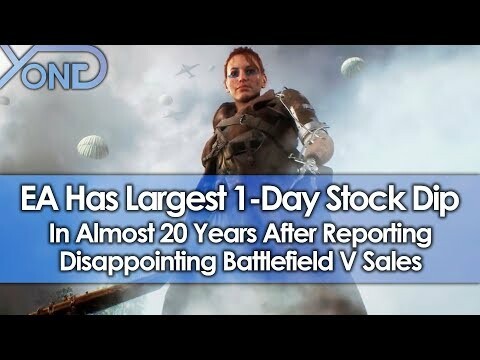 Investors do not know that though, they do not play BFV and do not play games in general either. They might know that BR is the hot manure these days so EA adds that buzz word to reinstall trust in the brand. So really the only thing we can take from this statement is what we knew already: That the game is an underperformer but we received some numbers at last. And then to think a "simple" WW2 reskin of BF1 with removing RBD (and no agenda) would probably have sold 15m. This wasn't a comment to the battlefield community. It was directed at shareholders who know nothing of gaming in general. EA's stock has not been doing very well recently and yesterday took a nosedive when they reported earnings. This isnt all on EA, DICE still developed and threw it together. They can share the blame and I honestly hope their fiscal trend continues as it is. They are dead in the water by next fiscal cycle with no major releases coming. DICE better start updating resumes. those shareholders knew enough to pull investments when they delayed the launch, and by huge numbers. and EA hasnt been doing well at all, in any aspect of finance markets. They will also continue to slip, for years as a result. Sad to hear that the shoe-horning of the wamens into the WW2 setting didn't bring in the larger player numbers. I'm just kidding, I'm not sad at all. Very pleased that #EveryonesBattlefield is a ballsup. Every bit of bad news around this game is GREAT news. I don't think that's completely true, as EA's share price has climbed a little bit since the new year. But to be honest, I don't really care about EA as a company, since I think it's pretty solid. I'm only concerned with the direction it is taking it's games in. I'm not into FortNite, Pubg or any of these games. I also don't like loot boxes. Which means EA's games won't appeal to me at all, and that's a bit worrying. I've brought this up before... I'm thinking they are going to make Firestorm freemium and toss us some bones to make up for it. They need to make money and they are more likely to make some with higher profit margins by selling skins and stuff than physical copies of this game at this point. Firestorm will be the hook to sell the actual full game. Just wait for it, it's coming. Be interesting to see if Apex influences any of the decision-making henceforth. They are either deluded, stupid or lying to say a difficult release window and the lack of Battle Royale is what hurt the launch. It's the bad design, incomplete and missing features, bugs and, yes, the pre-launch furore that hurt the game. I think their point is they should have prioritized releasing the game with BR rather than single player - not necessarily that single player is a bad idea (because frankly it was somewhat successful and well-received for BF1). I think they do have a point that releasing the game with BR would have probably drawn more players in initially, if anything out of curiosity. Really between that and the other games they were going against (1-month delay did not help) they should have just released the game this March. And I'm assuming them saying this is the largest BF means it probably does have the largest current player base (meaning it has surpassed the dwindling numbers of BF4 and BF1), but that will only be true so long if content doesn't follow. I know I am a bit reassured that it seems they have enough momentum to keep on supporting the game, and have incentive to deliver the kind of content that will maintain the player base and keep them purchasing possible cosmetics. But I agree with others you will not have one without the other - so they need to dedicate some real resources to content development and pick up the pace a bit. Firestorm BR is the only thing they could possibly offer to get people playing this game. No amount of maps/content is going to bring back any gamers sour on this game at this point - it's too far down the road already. Too many mistakes to recover from, cut bait and move on. EA shares went down 10% with the delay news, in Jan it was down 45%, on top of tech in general being on the decline prior to that. The market reacted negatively to everything BF 5. Still is, go google their stocks currently and since this report. I'm sure it will go free eventually, but there would be a huge uproar from people who already feel a bit ripped off by deluxe if it went free too quickly. Six months of polish from it being available to owners of the base game might be a good idea. The 'largest' battlefield comment has to be in terms of gigabytes installed. It doesn't make sense to my brain any other way.